The ECO Scheme is a Government initiative with the aim of helping low income households to reduce their heating bills whilst reducing carbon emissions from homes. The Government introduced ECO3 in October 2018 and it is expected to run until March 2022. ECO was first introduced in January 2013 and it has evolved over the years. When ECO was first introduced it had 3 parts to it but from October 2018 it consists of just the Affordable Warmth Scheme. Affordable Warmth directs funding to fuel poor, low income and vulnerable households. ECO Scheme 2018 to 2022 concentrates on the Affordable Warmth part of ECO which is designed to help low income households keep their homes warmer. 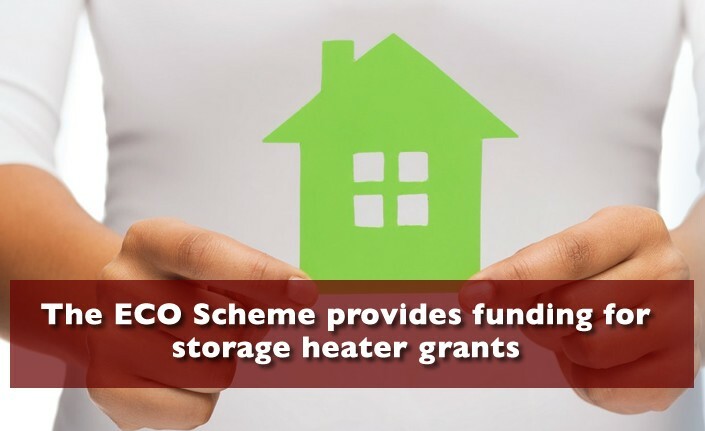 The ECO Scheme 2018 to 2022 (ECO3) has been designed to make a far greater number of households eligible for heating and insulation grants than any form of the ECO Scheme prior to this. 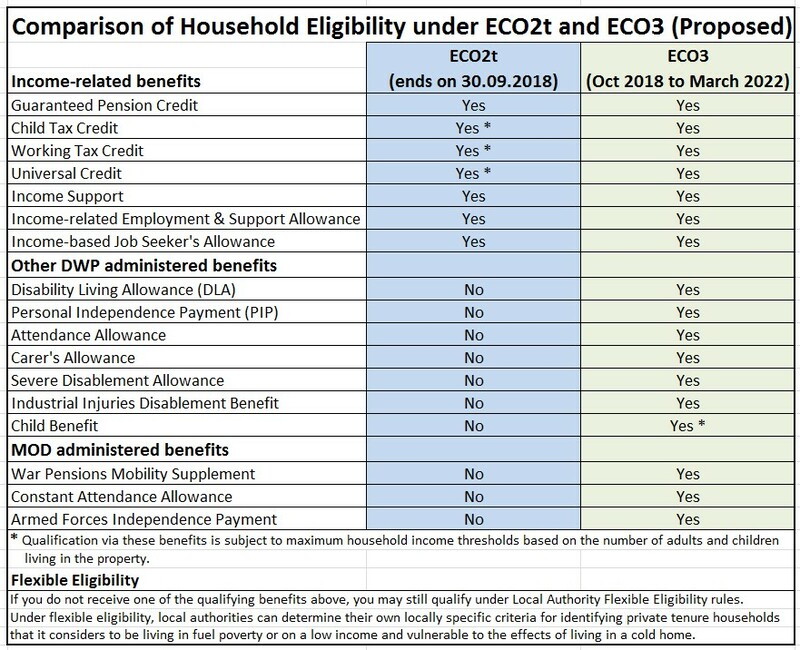 Households which didn’t qualify for an ECO grant prior to the ECO Scheme 2018 to 2022 (ECO3) may well do now. The following illustration shows who may qualify for a grant under ECO3 if the new rules are implemented according to current Government proposals. Changes have been made to which heating and insulation products attract grants under the ECO Scheme 2018 to 2022 (ECO3). Gas, Oil and LPG boilers – Limited funding is available to replace broken boilers. Coal-fired boilers – No funding will be available to replace coal-fired boilers. Electric Storage Heaters – Funding will be made available to replace electric storage heaters if all of the storage heaters in a property are broken and can’t be economically repaired. First time central heating systems – Funding will be made available for certain households where their home has never had an heating system installed. The main change for insulation under ECO3 is that all funding will now be available through the Affordable Warmth scheme rather than CERO (Carbon Emission Reduction Obligation). This means that successful applicants must be in receipt of one of the benefits or tax credits in the table above. Cavity Wall Insulation (CWI) – Can only be installed under ECO3 if the property is suitable to have CWI installed and that it has never been installed in that property before. Loft Insulation – Can only be installed under ECO3 in properties with less than 100 mm of insulation at the time of the ECO survey. Should Scottish Ministers decide to have a separate ECO scheme in Scotland for the ECO Scheme 2018 to 2022, the Government will split ECO funding between England & Wales and Scotland. The Government has decided to use an average of the previous three-year energy consumption as part of the calculation. It believes that using an average taken from the last three years of domestic gas and electricity consumption data is more equitable as it can take into account the impact of a year in which there was a mild or very cold winter that could result in unusual levels of energy consumption.